Free professional development resource. There is no single conference, workshop, journal, or professional organization that can compete with the volume of quality, timely and free information shared via tweets. My "tweeps" find and share the "best of the best," helping me to stay on top of what is happening in school libraries, educational technology, US education politics, and other topics that help me do my job better. I choose how to participate: No one is kicked of twitter for lurking. Those who do share can receive responses and feedback from teachers around the world. Fits my schedule: I view tweets when I have time, and only for a few minutes. I don't read every tweet, nor do I even try. I scan for topics of interest, only following links that appear to have merit. I carefully choose who I follow. Every person or institution that I follow must tweet as a professional -- either in education, technology, or a related industry. Once I see too many personal tweets, I simply unfollow. 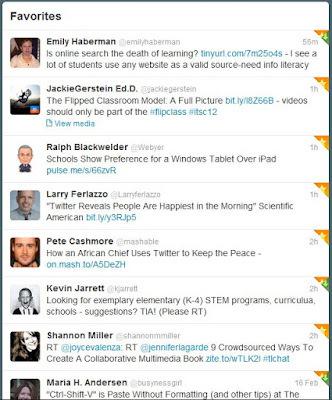 Find teachers who tweet at Twitter4Teachers Wiki and Educators on Twitter. International scope: Educators from around the world participate in an ongoing, never ending conversation about education. Multidisciplinary: It isn't just the tech teachers who tweet. Many times the posts point to a great blog post, video, or other useful resource related to science, math, language arts, history, civics, art, music, and every other subject area in schools. Timely: Much of what is shared on twitter is either new, or an attempt to integrate something new. This includes teaching styles, learning theory, educational technology, world news, politics related to education and technology. No Babbling: Thoughts and ideas must be concise, 140 characters or less. Links to greater detail, media support, or product websites are often included for those who have an interest to learn more. Hashtags: Follow and participate in a timely discussion, catch the essence of what is happening at a conference you can't physically attend, participate in a side conversation about a workshop or webinar your are participating in, find tweets on a very specific topic (see 20 Hottest Hashtags for Teachers on Twitter).